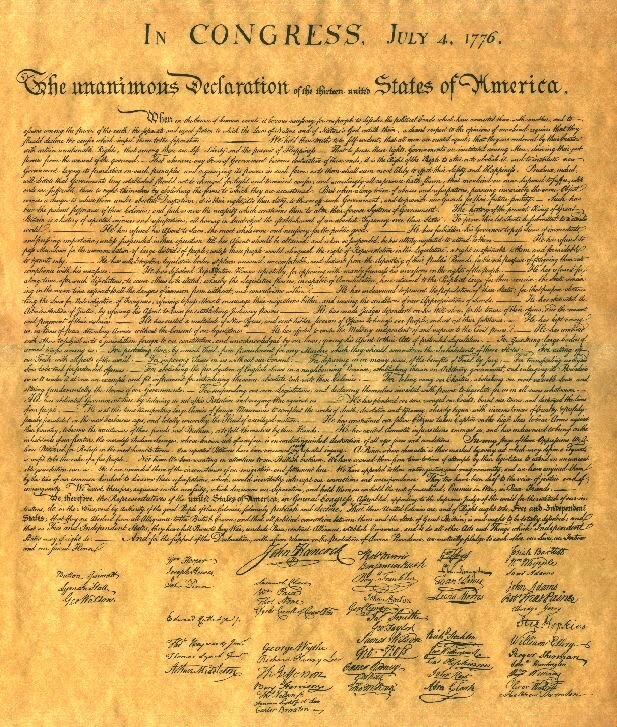 That whenever any Form of Government becomes destructive of these ends, it is the Right of the People to alter or to abolish it, and to institute new Government…(W)hen a long train of abuses and usurpations, pursuing invariably the same Object evinces a design to reduce them under absolute Despotism, it is their right, it is their duty, to throw off such Government, and to provide new Guards for their future security. Since God created man with certain unalienable rights, and man, in turn, created government to help secure and safeguard those rights, it follows that man is superior to the creature which he created. Man is superior to government and should remain master over it, not the other way around. The fact that “man is superior to government” and should therefore remain “master over it” seems like an anachronistic idea to some. Surely this idea has flipped since the creation of the Constitution. The status-quo now teaches that government is the master and that our rights are derived from it. Those who believe in state and personal sovereignty over the federal government are not in line with the status-quo. They are often labeled as extreme, seditious rebels causing disunity. Benson’s question, “What powers properly belong to each and every person in the absence of and prior to the establishment of government?” applies to state and personal sovereignty. In the absence of government, does the power, or authority, for one party to force another party to remain under the same bands exist? No! Responsible Unity—An example of personal sovereignty could be illustrated by a marital contract. Should the urge for unity supersede the right for others to separate themselves when they are being abused? Should a woman continue an abusive marriage where the husband coerces her to abide under his drunken dominion…for the cause of unity? Should she continue to support him and be loyal to him when he has repeatedly maxed out every credit card, betrayed her trust, broken his vows, and violated his side of the marital contract? Common sense would require a person to answer these three questions, irrevocably—No! How is this different in the national sense? Since the states have entered into a contract with each other, aka the Constitution, shouldn’t either side have a right to divorce itself once the contract has been repeatedly violated? Unity is ideal when all parties are being respected but to exalt unity at the expense of sovereignty is to rob people of their inalienable rights. While giving his speech, Stand Up for Freedom, Ezra Taft Benson spoke of “irresponsible unity”. Another recent development has been the call for national unity. I believe there needs to be a unity in our land. But it must not be blind, senseless, irresponsible unity. It should not be a unity just for the sake of unity. It needs to be a unity built on sound principles. If this has lead to disunity then by all means let us return to a program of sound Constitutional principles on which we can unite. History has repeatedly taught us that our government continues to give little to no regard to uniting under Constitutional principles. One might argue that the federal government has already seceded from the Constitution and therefore the people who wish to continue a Constitutional form of government aren’t actually advocating leaving the Republic but in restoring it. From this perspective—who are the rebels? Who are the law breakers? Who are the extremists? Who has caused disunity? We believe in being subject to kings, presidents, rulers, and magistrates, in obeying, honoring, and sustaining the law. It is apparent that latter day saints believe “all men” are to uphold their governments only IF their governments are fulfilling their duty of protecting its people’s inalienable rights. The idea that our national government has repeatedly overstepped its Constitutional bounds should be accepted by millions of LDS American citizens. Every President of the Church since Joseph Smith has warned of or pointed out violations of that sacred document. What if elected officials at the national level are no longer obeying, honoring, and sustaining the law which they have sworn an oath to do? Based on the above principles and scriptures—are LDS citizens required to remain subject to such a long train of abuses and usurpations? Hypocrisy and Tyranny or Liberty and Sovereignty—Many Americans, both LDS and not, have accepted a hypocritical policy of pushing for foreign states to separate themselves from their oppressive central governments (i.e.- Georgia Vs Soviet Union) but have long-since attacked the same policy when it applies at home. ‘Independence abroad but blind-unity at home’ is the motto of the pseudo-liberty-lover. What was once a moral principle of sovereignty, which laid the foundation of this country, has been replaced by an idea that oppression must be permissible for the sake of unity. Only the power-driven would spread such a lie and only an unprincipled ignoramus would accept it. We the people are sovereign. People are, or ought to be, masters over their government. People have the responsibility to sustain their government when the government is protecting their inalienable rights; but when governments become destructive to those ends it is their right and it is their duty to separate themselves from such oppression. These questions apply now: is your government fulfilling its role of protecting your inherent and inalienable rights? If not, for how much longer will this be tolerable? ps, that quote was authored by joseph story. He served on the supreme court in the early 1800’s. love it Jimmy.